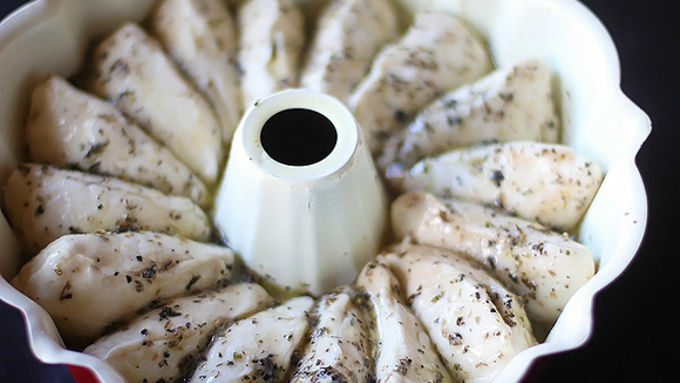 Grease a bundt pan with cooking spray. Set aside. In a small bowl, whisk together melted butter, garlic salt and Italian seasonings until combined. Set aside. Remove biscuits from the cans. Take a raw biscuit, and cut a slit in the side. Use your fingers (or carefully use a knife) to open up the biscuit to form a pocket for the toppings. Carefully tuck a pinch of cheese into the pocket of the biscuit, then add in a teaspoon or so or marinara sauce, then add in some pinches of your pizza toppings, top with a final pinch of cheese, then use your fingers to pinch together the dough to seal in the pocket. Be sure that it is well-sealed. Dunk the pocket in the butter mixture on both sides, then place in the bundt pan with the seam side up. Repeat with remaining biscuits until they are all filled and placed in the bundt pan side by side. You should have about 15 little pockets all lined up next to each other, with the seams on top. Pour any remaining butter mixture over the top of the biscuits in the bundt pan, then bake for 30 minutes until the dough is cooked and lightly browned. Remove and let sit for 5 minutes. 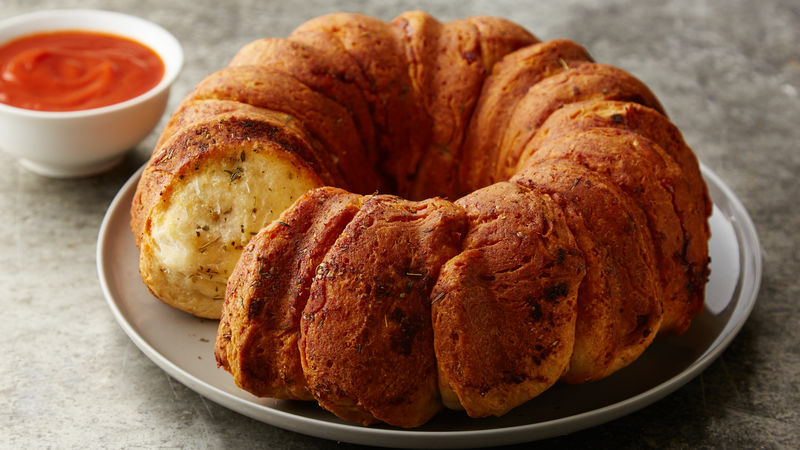 Carefully turn the bundt pan on top of a plate and give it a slight jiggle to release the monkey bread. Then remove the pan and serve the monkey bread with a side of extra marinara sauce for dipping. 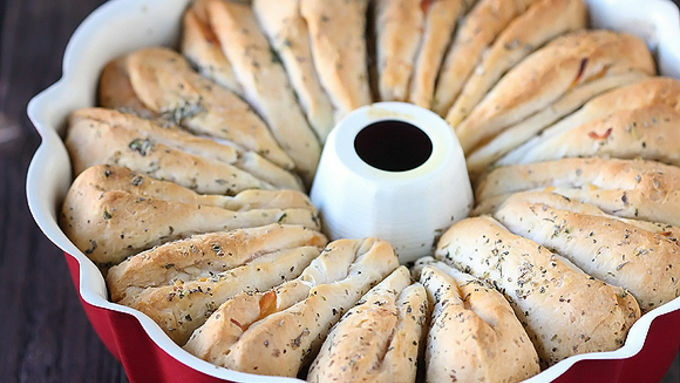 A ridiculously fun and delicious twist on your favorite pizzas! 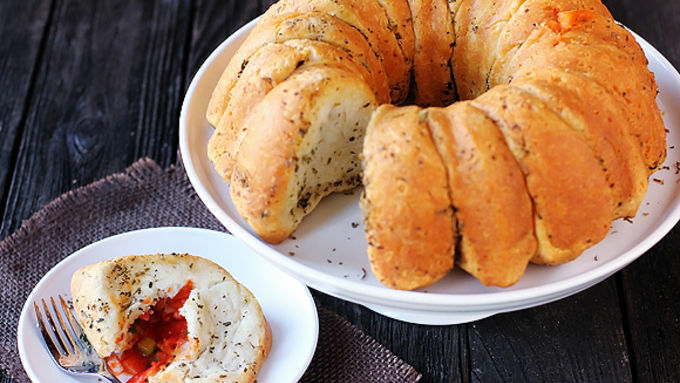 Just when you thought pizza couldn’t get any more delicious, along comes this super cool way to eat it – baked inside of monkey bread - Pizza Monkey Bread! Whaat? You heard right. And it's super easy to make too! Chop up some of your fave pizza toppings. 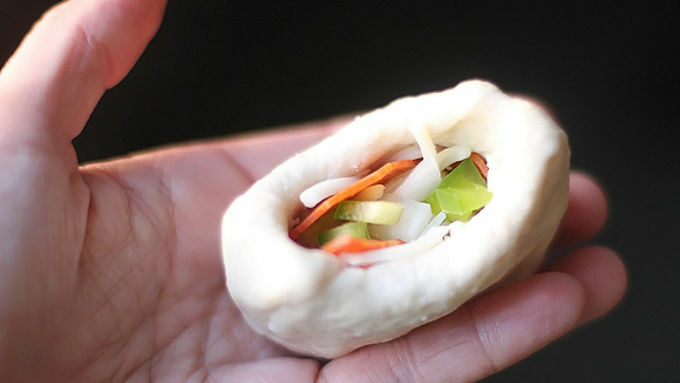 Use anything you like (as long as you can chop it into small pieces that will fit inside of the pizza pockets). Be sure to cook any raw meat, like sausage, ahead of time. Then just stuff the pockets with tasty goodies, pack them all cozy-like into the bundt pan, bake and devour. Serve it up with extra marinara sauce for dipping, if you’d like. A perfect snack for game day or an easy weeknight dinner. Your friends and family will love you!